Converse seems to be in one of the most interesting parts of it’s history right now. Nike Inc. bought the company back in 2003, for a whacking $305 million, but we’ve seen little crossover between Nike and Converse until recently. For over a decade, Nike Inc. kept their brands very separated, almost shying away from letting the public know that they were in cahoots, but with a few developments in CONS and the recent Jack Purcell Signature, quickly followed with the Chuck II, Converse and Nike seem to be ready to let the world know that they are now related. The Chuck II may not look very different from it’s predecessor, which is the point, but it signifies a large-scale change at Converse; a change that will see the brand put it’s focus back onto innovation, much like it’s parent company. Something that I don’t feel the brand has focused on since the 1980s. 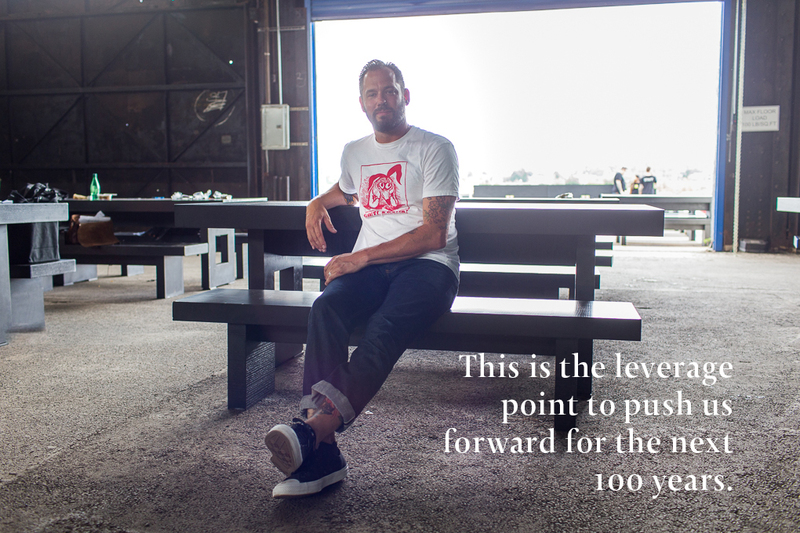 The pinnacle of this change in direction will culminate at the end of this year in the form of a brand new Converse innovation centre in Boston, not too far from the newly built Converse HQ in the same city. This announcement struck me as a little odd, because let’s be honest, people aren’t quick to put Converse and innovation in the same sentence. Instantly I found myself wondering what exactly they plan to do in this new centre and how it will steer the brand. 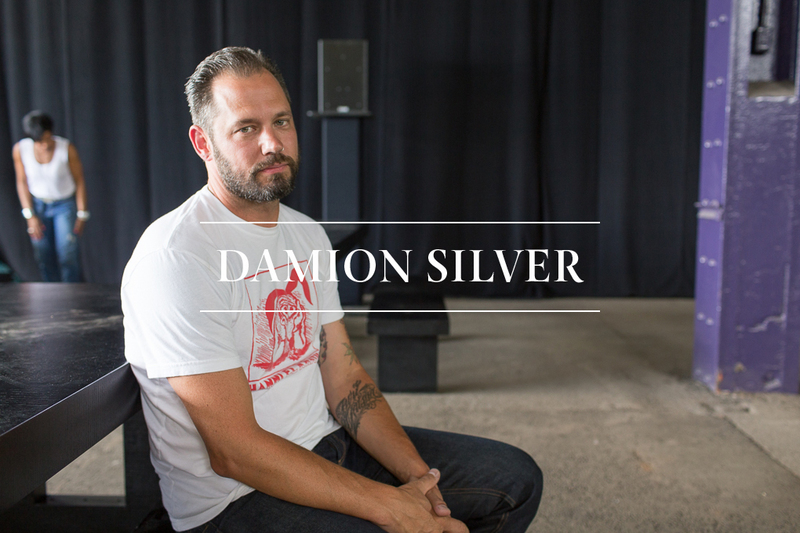 I was fortunate enough to put a few questions along those lines to the person most likely to use and benefit form this development, Damion Silver. 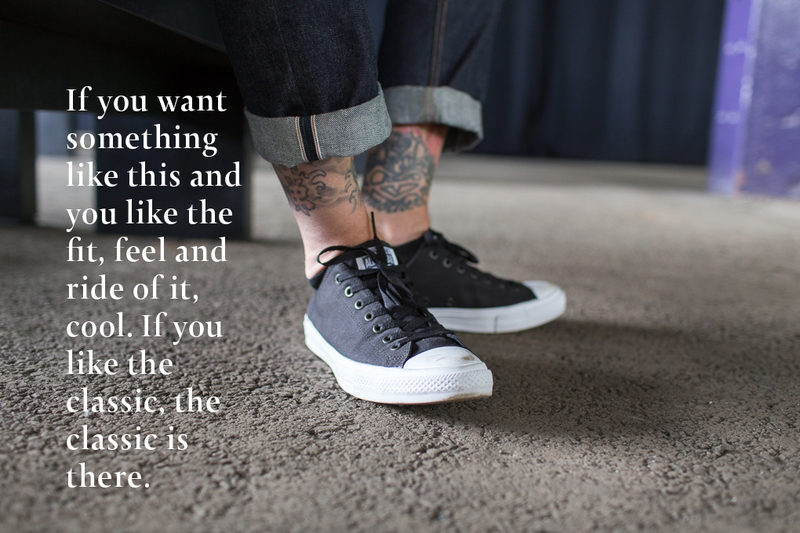 It became clear throughout the few days I had in Converse land that the distinction between Nike and Converse is a clear one for those on the inside; Nike is all about performance, Converse is all about lifestyle. It’s worth bearing this in mind when reading the interview below, as it gives it an interesting context. It’s clear that a lot of time, thought, and effort have gone into these modernised silhouettes, well beyond the shoes themselves, and I’m intrigued to watch as a new Converse starts to emerge from the brand we all know so well. I get the feeling it will be a subtle, but meaningful shift, much like the Chuck II itself. Hidden details. What’s it like seeing a project this big, that you’ve lead, finally coming into existence? Coming in, seeing the big production, seeing it all come together, and to finally not have to keep everything in secrecy is nice. How long have you been keeping it secret? Since its inception [laughs]. Almost 2 years… 18 months. Working on it secretly, or in a bubble, and as time has evolved and samples start rolling in and stuff, people are more privy to what’s happening. Did you wear test the samples yourself? Do you ever get involved in that part of the process? We had some folks internally. I’m off-size, I’m an 11.5, so to get in tooling and that sort of pieces and parts, I had to wait a little longer. So I had to work with my trusted fit-size folks to make sure we were doing what was right. I had to rely on some outsourced input. It must be hard to deal with, working on an exciting project that you can’t wear yourself for a long time. Yeah, yeah, it’s difficult [smiles]. Luckily for me, all 4 of the guys that I work with are 9s and they work on the category with me, so I trust them to tell me if we’re full of it or not. It’s pretty good. How exactly does your role as Global Design Director for All Star work within the Converse brand? Within the brand, I’m the Global Design Director for Men’s All Star specifically, so basically any men’s product within the All Star Chuck Taylor range, I creative direct it I guess you could say. Other than the Chuck itself, how far does that sub-brand extend? Excuse my ignorance, but it’s easy to assume that the All Star brand pretty much just covers the Chuck Taylor. Most people would agree with you there. We have a lot of other peripheral products, we have Fultons, Asylums, our boots line, there’s probably about ten or fifteen other silhouettes or styles within… Hi, Ox, Boot, whatever, let alone all the other regional creations and stuff. There’s quite a few out there, but clearly everybody knows the Chuck. So, the Chuck II. We’ve heard a lot over the last few days about how it has come from consumer feedback about comfort and wearability, but you must have been getting feedback along those lines for a long time because it’s not exactly new insight. At what point did it become a realistic project and get the go ahead? I think it was close to 2 years ago. There were some conversations around “What do we do? How do we diversify? How do we deliver more?”, kind of like “Does the Chuck cut it? What do we do here? How do we integrate innovation in the product?” It started as a casual chat that quickly escalated. Once we started wrapping our head around what we could do, and probably more so listening to consumers as to “I want more. I expect more.” and I think to a certain degree listening to people that work here. A lot of core consumers work within the brand and they were like “Yeah, I want more. Can you do this? Can you do that?” I think all of that coming together, we were at a good point to do that and to leverage our parent company. What’s it like trying to innovate such an iconic shoe without disturbing it? At first it was a little daunting, but once we got into looking at the Chuck itself, and holding ourselves to not messing with it too much, once we agreed on not messing with the Chuck we went from the inside out, so that steered us in the right direction quite quickly. The model speaks for itself, but it’s really all integrated. Only in discovery do you really realise the innovation and things that have been done to it that evolve it. And for you, why is the Chuck II and the modernisation of your classic silhouettes an important move for Converse as a brand right now? Well I think for us it’s kind of a pivotal play as to acknowledging and doing things that are innovative. As subtle as this may be on the outside, integrating that innovation into it and creating a product for more is a catalyst and a door opener for us to create new and more innovative product, making Converse and innovation more synonymous. To tether those two things together. A few years ago, I don’t know if people would have done that, but now I think that this is the leverage point to push us forward for the next 100 years. Do you think that this innovation story is something that has always been missing from Converse, or have recent changes in the market brought to light the need to innovate? I think we’ve always done it, we’ve just not celebrated it in the loudest of ways. As a brand we’re less in your face around marketing and screaming it, where as this will tell the story for us. I think the consumers will almost tell the story for us. It gives us a bit of confidence. Again, leaning on the consumer thing, they tell us they want that, so I think that as long as we keep that balance of being right for the brand and providing technology in whatever way, shape, or form that may come, I think people will begin to expect that more from us and want it as well. And how about this innovation centre that Converse are currently building in Boston to accompany the new HQ? How does that fit into this? That’s exciting for us too, right? To the point of not being sample size or whatever, to be able to get your hands on materials and really truly come from a personal perspective, to make sure that what we’re doing from the jump is right. When we get that innovation space that’s opening up at the tail end of the year, I think it’s going to be an amazing unlock for the designers and other people. Well, it’s based around comfort and functionality, wether that’s exploring material options, wether it’s exploring fit and enclosures and things of that sort. I think to be able to have that at hand and just explore, even if it’s not at a functional level, but combining function and style, to strike a line and be able to create an upper and look at it and be like “Does that look right?”… there’s a world of difference between the screen and a physical object, so to be able to do that within moments or hours in a physical space, you’ll be able to pioneer things that take you sometimes a lot longer, depending on working with factories and certain stuff. So if the Chuck II symbolises the starting block of the future of Converse, where do you see it going from here? Oh wow! We have some stuff in the works that already innovate on this platform, so you’ll start to see that. Really functional drivers. Functionality. The Chuck II should be synonymous in delivering maybe the unexpected from us. I’m not at liberty to say exactly what those things are, but I think if you can think of what this does with the Chuck, I think you can imagine through materials, colourisation, those sorts of details, collaborations, these will all follow suit. Would you say that this is the first major development of the Chuck Taylor All Star since its inception back in 1923? In some ways. I mean, the Chuck ‘70s are a little different. There’s been some other derivative stuff; we’ve made Chuck sneaker boots and things of that sort. The technology or the construction of it will stay with it. Over the years, pre my existence, Converse were always innovating. If you ask the archivist, from day one to the first ten years of the company, they were always trying to innovate on the Chuck, or the All Star at the time, to make it new and with the best materials. For us, you’ll continue to see us work with the best materials, the best things available. So to finish, do you think that the Chuck II will ever replace the original Chuck Taylor? No way! [laughs] No way. I mean, there’s purists. We’re here because that [points to the Chuck Taylor] has done its thing. I bounce back and forth between the ‘70s, Chuck II, Chuck, depending on my mood, what I’m looking for, whatever. I’ve got some pairs that are broken in just right and it’s like “No way would I ever go back to anything!” In my mind it’s a mood thing. What am I in the mood for? I don’t think it will ever replace it. I think it’s a kin to it and I think it gives us the diversity and gives people options. If you want something like this and you like the fit, feel and ride of it, cool. If you like the classic, the classic is there.